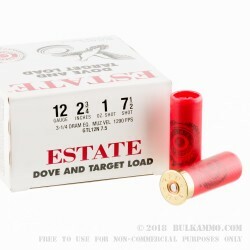 Based in Minnesota, Estate Cartridge specializes exclusively in the production of reliable and affordable shotshells for the field and for the range. 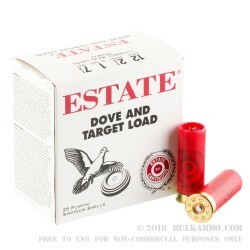 This 12 Gauge shell features a progressive burning powder that ensures a consistent muzzle velocity of 1,290 fps, as well as a reliable primer, durable plastic hull, and strong plated metal head. 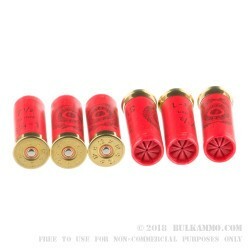 This shell offers one ounce of #7.5 hard lead shot. Its hardness helps it keep in a tight pattern when fired, and additionally means it carries the momentum needed to take down game from distance. This shot’s versatile size is appropriate for great number of game, whether you are hunting for birds including quail, pheasant, and dove, as well as other small game such as squirrel, rabbit, and racoon.